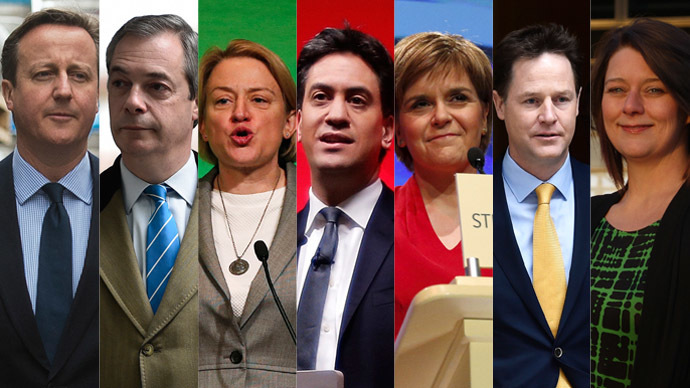 The televised pre-election debate is underway, featuring the leaders of Britain’s seven major parties: the Conservatives, Labour, the Liberal Democrats, UKIP, the Green Party, the Scottish National Party and Plaid Cymru. After two intense hours, your beleaguered RT correspondents are signing off. The YouGov poll is also pronouncing Sturgeon as the winner. The polls are beginning to come in. The Economist says that Sturgeon edges it. Final verdict on Britain's first seven-way TV debate (/10): Bennett 3, Wood 4, Clegg 5, Cameron 6, Miliband 6, Farage 7, Sturgeon 9. The questions have come to a close. Time for closing statements. Sturgeon says the other parties will only provide cuts. The SNP will provide something different, and will not continue with the 'wrong' priorities. She says the SNP will provide change in Westminster. Clegg asks the public to decide what is best for voters families and the country. He advocates cutting less and borrowing less, and present the LibDems as a central party or fairness and equality. Miliband says workers will be rewarded. He promises to tackle tax avoiders and energy companies, and promises to balance the books. Wood says the Welsh party thinks austerity is a choice, adding that they will provide a stronger, more prosperous and greener wales. Bennett also promises change from the Greens. She says voters do not need to keep voting for the lesser of two evils, and says the country needs more MPs like Caroline Lucas. She promises a peaceful political revolution. Farage still maintaining that the others are all the same. He plays up to the camera, saying the other politicians do not understand the common man. He advocates pure patriotism and good, common sense politics. Cameron praises the work of the coalition government. He pledges to continue creating jobs and cutting the deficit. He urges voters to stick to the plan laid out already. How will the leaders make the generation feel optimistic? Cameron says that the economy and global significance of Britain should keep the young optimistic. An member of the audience speaks out about homeless veterans. She is told to be quiet, but gets acknowledgement from the audience. Bennett says that in order to be optimistic people must begin to tackle environmental problems, saying 50 percent of wildlife has disappeared. Farage talks a lot about how good Britain is, but doesn't really say anything. Wood pledges to create 50,000 new jobs to keep the youth optimistic. Clegg says the slate must be wiped clean for the next generation by clearing the debt and the deficit. Miliband says that the abolition of zero-hours contracts would provide more stability and optimism for young workers. One user said Nicola Sturgeon and Leanne Wood have done "far better" while Farage and Cameron are the "worst." @RTUKnews Nicola Sturgeon and Leanne Wood done far better. Worst: Farage and Cameron. Another user said Farage is "the best by far." Clegg introduces a rent-to-own scheme for those who cannot afford to save for the mortgage on a house. Farage says the housing issue is exacerbated by immigrants. He adds that people want to build on greenfield sites because it's cheaper, but thinks brownfield sites should be released for rejuvenation and house-building. Sturgeon says it's important to help protect the price of affordable homes.